Australian children's TV in the 60s and 70s seemed to have more local content, as opposed the imported variety, usually from the US, that is so ubiquitous today. Some of these old home-grown shows were quite imaginative and one in particular that springs to mind was the popular ABC series Adventure Island which ran on Australian TV from 1967 to 1972 - a healthy run of five years. The series was the creative co-conception of script-writer John-Micheal Howson (who also played Clown) and director Godfrey Phillip, who had both created the successful kids show The Magic Circle Club, which ran from 65 to 67 and aired on ATV 10. At that time television had only been up and running in Australia for a mere ten years and in terms of home-grown TV production, everything was indeed, an adventure. When Magic Circle club was cancelled over at channel 10, the ABC (public broadcaster) wanted to take over its production but studio head Reg Ansett refused to relinquish the rights - thus Adventure Island was created to fill the void. 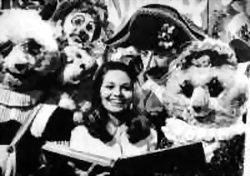 Adventure Island was a magic land, accessed through a big book at the beginning of the show, which would later be replaced with an opening set in an enchanted wood. One of the best things about the show was the style and layout of the "town", the melodic sounding Diddley Dum Diddley, where most of the characters lived - a stagey set of quirky houses and shops with a centre area where the inhabitants would gather whenever anything of note occurred. It allowed for a constant interaction between the characters, as well as frequent musical pieces. In the best melodramatic tradition, most of the storylines reflected a simple, black and white morality tale, with good, as represented by the townsfolk, triumphing over evil, represented by the bad guys in the castle on the hill. Sometimes the villains would get a breather and the story would revolve instead around a visiting character to the town. However, whatever the trials and evils the townsfolk faced, the audience would always be reminded via an unsubtle aside, that all be '' allright by Friday". The show was visually rich and full of ham acting, quaint sets, eccentric costumes, over-the-top stereotypical villains and quirky characters, although as original host Nancy Cato remarked in the video below, the feel was "more pantomime than camp". Cato left the series after a year and was replaced by Sue Donovan (Jason Donovan's mother). Both women had also hosted The Magic Circle Club at different times. However hokey, pantomimey or campy the show may have been, it proved to be enormously popular with Australian children and is now regarded as something of a legend in the annals of this country's TV history.